The Orchestre symphonique de Montréal and Kent Nagano are pleased to announce the release of Danse macabre, the second album produced in collaboration with Decca, the prestigious record label. 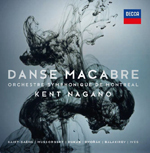 Danse macabre follows on the heels of L’Aiglon, the lyric drama by Honegger and Ibert recorded by the OSM and Kent Nagano as a world premiere. L’Aiglon has earned numerous honors since its release in March 2016, including an ECHO Klassik award. Danse macabre, a new recording conducted by Kent Nagano, will win over new enthusiasts, seasoned music lovers and the entire family. Six major works from the repertoire share a common theme: Halloween. And although they were not all composed specifically for the occasion, the works evoke aspects that are characteristic of the dark holiday, including death, sorcery, skeletons and demons. “The late 19th and early 20th centuries witnessed great advances in technology, and a simultaneous rise in concern for matters of secular spiritualisma trend also observed in our current technological age,” points out the OSM’s music director, Kent Nagano. “This cyclical enthusiasm for the supernatural and the occult tends to pervade popular consciousness and artistic production, no matter how advanced and rational the society. As such, it is a theme that transcends nationality, culture and time. The album was recorded over the course of three concerts presented on October 29 and 30, 2015, at the Maison symphonique de Montréal. It features the Orchestre symphonique de Montréal and Kent Nagano performing works by Dukas, Dvořák, Mussorgsky, Balakirev, Saint-Saëns and Ives.